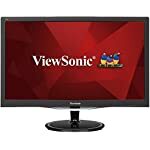 The Viewsonic XG2402 is a game orientated monitor with a number of key technologies that make this an attract buy for those looking for a fully functional yet reasonably priced gaming screen. It includes 144Hz refresh rate, FreeSync compatibility and a very responsive low lag TN screen wrapped up in a 24″ package. I am an owner of the predecessor to this model, the XG2401, so have an added interested in this new addition to the Viewsonic line up. I’m keen to see what’s changed but also secretly hope it hasn’t evolved too much as that will make me regret my purchase of the older model earlier in the year! The stand base of the XG2402 is much smaller compared to its predecessor, this is handy if you want to save on desk space. VESA 100 x 100 mounting is an option and actually I have my Viewsonic mounted on a monitor arm. If desk space saving is a must then this is even more preferable in my opinion, but the arms do come at additional cost. The XG2402 is the first Viewsonic to get the RampageX treatment, this is a new line of branding that I’m sure we’ll see in other monitors that let’s you know this is a gaming monitor. According to their marketing blurb this feature is “a unique design feature that radiates a subtle red glow”, now I’m not sure if that’s a big selling point to many but then I have actually stuck LED lights to the back of my XG2401, so perhaps I could have benefited from this! 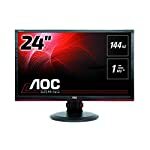 The monitor is built around the AU Optronics M240HW01 V80 panel, commonly found in modern 24″ 144Hz TN HD panels. It is fully geared up for gamers so if this is your primary use then you are going to get a nice package. You get a fast refresh rate, this screen can run at 144hz. This is a must for any gamer in my opinion and a reason why I bought this monitor’s predecessor, the XG2401. The XG2402 also comes with FreeSync included, if you have a compatible AMD card then you can take advantage of this functionality to get smooth tear free frame rates regardless of whether your GPU can output a constant 144 frames per second. This model has a FreeSync range of 48 – 144Hz, so it won’t help if your card can’t muster a minimium of 48 fps but it does also includes AMD’s LFC for lower frame rates. We give the Viewsonic XG2402 a 4.5 out of 5 rating. Want to know what existing owners of the monitor think? You can read real user reviews here. 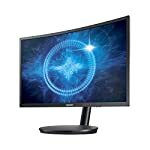 Should I buy the Viewsonic XG2402? A small but welcome update to the previous model, as an owner of the XG2401 I'm going to recommend the update too! 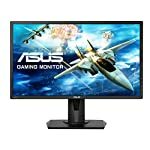 A great fully functioned gaming screen at a decent price. If you can spot the older version at a discounted price then it would be worth a look too. If you are having some doubts about this purchase then why not read some real owner reviews and see what other buyers think.